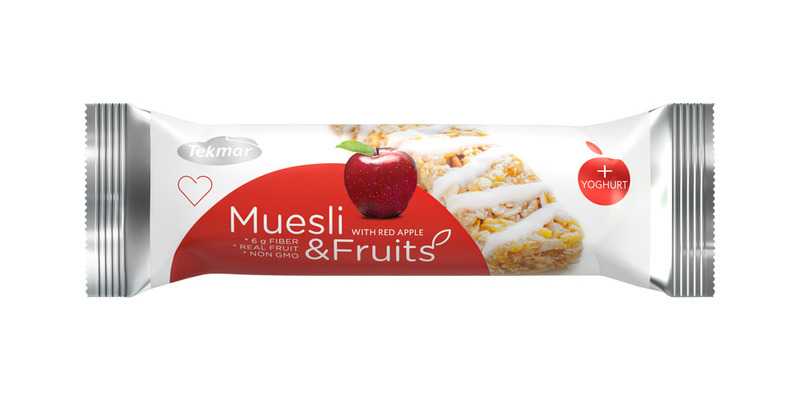 Do you already know Muesli & Fruits? Tasty fruit muesli bars with fine low-fat yoghurt topping. As an ideal “snack” at work, at school and on your travels, they will delight and fill you up. Thanks to their attractive packaging you can find them very easily in the best fruit flavours: cranberry/goji, blueberry and red apple. oat flakes, glucose-fructose syrup, extruded cereals (wheat flour,maize flour, rice flour, sugar, salt), yoghurt coating (sugar, fully hydrogenated palm fat, whey powder, yoghurt powder, lactose, emulsifier: soya lecithin, acid: citric acid, flavouring), dried apples (antioxidant: sulphur dioxide), raisins, wheat flakes, corn flakes, palm fat, sugar, apple concentrate, maltodextrin, barley malt extract, emulsifier: soya lecithin, ground cinnamon, salt, acid: citric acid, flavouring. oat flakes, glucose- fructose syrup, extruded cereals, (wheat flour, maize flour, rice flour, sugar, salt), yoghurt coating (sugar, fully hydrogenated palm fat, whey powder, yoghurt powder, lactose, emulsifier: soya lecithin, acid: citric acid, flavouring), dried prunes (antioxidant: sulphur dioxide), wheat flakes, cranberry component (cranberries, sugar, sunflower oil, elderberry fruit concentrate, acid: citric acid), corn flakes, palm fat, sugar, blueberry concentrate, dried blueberry (antioxidant: sulphurdioxide), maltodextrin, emulsifier: soya lecithin, salt, acid: citric acid, flavouring. oat flakes, glucose - fructose syrup, extruded cereals (wheat flour, maize flour, rice flour, sugar, salt), yoghurt coating (sugar, fully hydrogenated palm fat, whey powder, yoghurt powder, lactose, emulsifier: soya lecithin, acid: citric acid, flavouring), dried goji (antioxidant: sulfur dioxide), wheat flakes, corn flakes, cranberry component (cranberries, sugar, sunflower oil, elderberry concentrate, regulator of acidity: citric acid), palm fat, sugar, maltodextrin, barley malt extract, emulsifier: soya lecithin, salt, acid: citric acid, flavouring.